Appointment Aid lets you easily schedule Phone call, text message (SMS), and/or email appointment reminders for your clients. You can send custom messages and custom times. 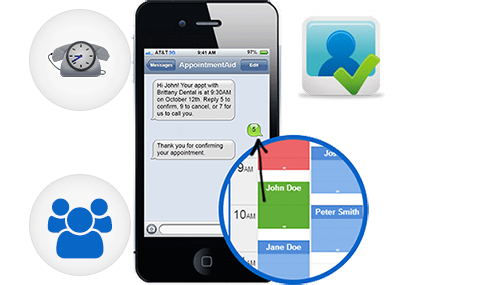 With Appointment Aid you can send out phone call appointment reminders, text message / sms appointment reminders, and / or email appointment reminders. You don't have to choose just one, you can send all three! Appointment Aid allows your clients to confirm or cancel their appointments with you via the reminder. They can also request that you contact them. Worried about calling your customers from a random phone number? Don't worry! You can set up caller ID within your Appointment Aid account which will allow phone calls to appear as if they are coming directly from your phone number. With Appointment Aid, not only can you sent out phone call, text message, and email reminders to your clients, But you can actually customize what message is sent to them. Appointment Aid allows you to manage multiple sets of phone recordings, text message, and email scripts for different reminders that you would like to sent to your clients. When scheduling an appointment, simply choose which set of scripts to use for that appointment, and what type of reminders you would like to send. (Phone reminders, text reminders, and/or email reminders). With Appointment Aid you can actually customize WHEN the reminders are sent to your clients. By default, reminders are sent about 24 hours before an appointment. But if you click on "account", and then click "edit reminder timing profiles" you are able to change the default settings or add new reminder timing profiles. You can add up to 2 reminder times in a reminder timing profile. This means theoretically you could remind a client 6 times (2 phone call, text message, and email reminders) for a single appointment. You can also choose to send reminders up to 14 days before an appointment. When scheduling an appointment, simply choose which reminder profile to use for that appointment and reminders will go out exactly when you want them to. In Appointment Aid you can create multiple calendars and user accounts for your employees. Lets say you run a massage business with 2 massage therapists, John and Mike. By clicking the "calendars" button, you will be taken to a page where you can Create new calendars for both John and Mike. Each of their calendars can have separate schedulable hours and settings. By clicking Account, and clicking "manage users" you can add a new user account for Mike so both John and Mike can login to the account. Once added, both users can login separately to the account and access their calendars. In Appointment Aid we offer multiple ways of viewing your calendar and scheduled appointments. By default your account will be set up to use the month-overview + individual day view setup. This is best for businesses that schedule multiple appointments during the same time slot. Other businesses that do not have multiple scheduled appointments in the same time slot may enjoy the week view + small month calendar setup. This shows you a view of the week's schedule and has a small month calendar on the right side to use for changing which week you are viewing. With Appointment Aid's client management system, you don't have to worry about repeatedly entering your clients information when scheduling appointments. Your client's contact details and reminder preferences are all saved so all you have to do is start typing your clients name and then click on the suggested name to auto-complete the appointment fields. Additionally, you can click the "clients" button from the main menu to go to the client management page where you can see a list of all of your clients and client settings, add new clients, and edit or remove client information. 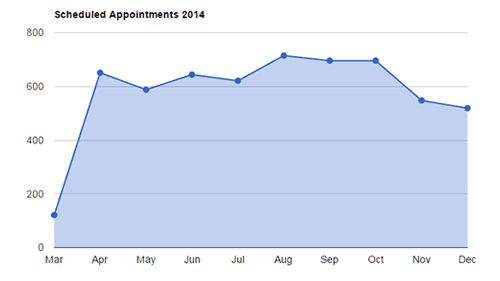 Get real reports and graphs from the stored appointment data. See just how much you are using Appointment Aid. Estimate how much you are saving. Want to find out exactly how many people confirm, cancel, etc for their appointments? Have an idea for a statistics report that we don't already have? We routinely make custom statistics reports for our clients, all you have to do is contact us and ask! Appointment Aid's support team is always available to help you with any questions or issues you may have. No question is too small! Feature suggestions are welcomed too! All Appointment Aid data is secure and 100% backed up. Rest easy knowing your data is safe with us. For more information on our security measures, please visit our security page here. So what are you waiting for? Start Your Free Trial Now. Still have questions? Please don't hesitate to Contact us. Try ANY plan FREE For 30 Days!